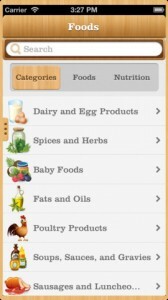 My Nutrition is an iPhone app developed byCodekia Pty Ltd.If you care about what you’re putting into your body, this is an important tool to add to your app arsenal. My nutrition boasts a database with over eight thousand food items, and you can see food energy values as either kJ or calories. There’s a handy food diary as well, and it’s all packaged in an attractive, woodgrain-inspired interface. One thing I’d love to see in a future edition of My Nutrition is some flexibility in terms of expressing what personal nutritive path you are trying to follow. Maybe it’s because I’m totally enamored with the “Fatatarian” diet espoused in the documentary “Fathead” (somewhat similar to the Atkins and Paleo diets), but I think it would be good for this app to allow users to embrace some non-USDA approved ideals of what a diet should be. Everyone has their own ideas of what “healthy” food looks like– a vegan’s ideal “healthy” meal probably looks quite different from someone doing Paleo. 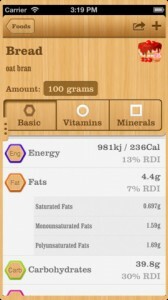 As it stands now, this excellent app does let you create recipes according to your own dietary requirements. As a bonus, My Nutrition will calculate the total nutrients for each recipe you add. Overall, My Nutrition is a very simple app that’s attractive, well-organized, and a delight to use. The reliance on USDA standards may turn off some dieters who are adhering to restricted diets. One super-great aspect of this app are the less-common food categories. 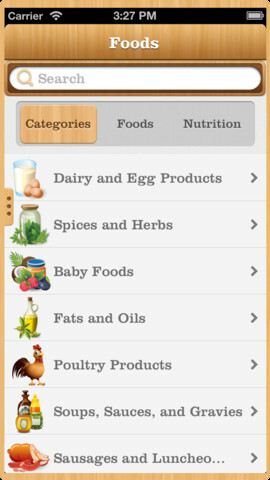 These include Spices & Herbs, Baby Foods, and Fats & Oils, categories that can be not very well populated in similar apps. 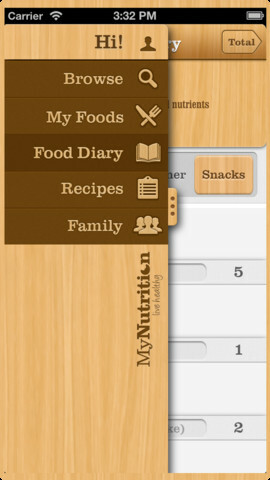 If you want to eat better, this is a great app to start with. 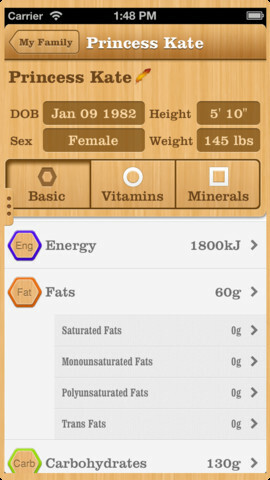 My Nutritionis compatible with iPhone 3GS, iPhone 4, iPhone 4S, iPhone 5, iPod touch (3rd generation), iPod touch (4th generation), iPod touch (5th generation) and iPad. Requires iOS 6.1 or later. This app is optimized for iPhone 5.